What is typically an exhibition in the political slug fests common to Hoboken is surprisingly becoming an early thermometer of influence and leadership preceding the important November council ward races. At least for Reform's Old Guard opposition. In one corner: the surprising victor who's KOed the Beth Mason family wallet for the largely ceremonial Hoboken Democratic Chair, current occupant Jamie Cryan could call it a day and depart having flat out beaten the odds in the Hoboken derby. In the other corner: the reluctant Freeholder Anthony "Stick" Romano who didn't seek this showdown and finds status symbolically at stake as he looks to stay unmarked before the 2017 Hoboken mayoral sweepstakes officially begin. Current Mile Square Democratic Chair Jamie Cryan who's never say die effort against long odds has made tonight a crash worthy event if you are one of the select party committee members holding a ticket to the big dance at the Hoboken Democratic Committee vote set for 8:00 at Room 84. Much cajoling, begging, pleading, attempted bribes and intimdiation since; Beth Mason's the odd man out as Jamie Cryan musters one last push versus Freeholder Anthony "Stick" Romano in tonight's showdown. Apparently, the Hudson County Democratic Organization (re: HudCo) truly believes the road to the NJ Governor's seat in 2017 runs through Hudson County and Jersey City's City Hall. With that focus and HudCo eyes looking south to Trenton the buzz word is "unity" meaning councilwoman carpetbagger in the enemy camp of South Jersey, re: Beth Mason and the Mason family checkbook are persona non grata. The litigious Beth Mason is not done begging though. Iced out of the official Hoboken Democratic Chair sweepstakes, she's making a last ditch plea for the honorary position of Democratic Chair currently held by Mayor Dawn Zimmer. Final word on that sidebar of a race will come after the main event tonight when the elected members of the Hoboken Democratic Committee put in their votes for Hoboken Democratic Chair. 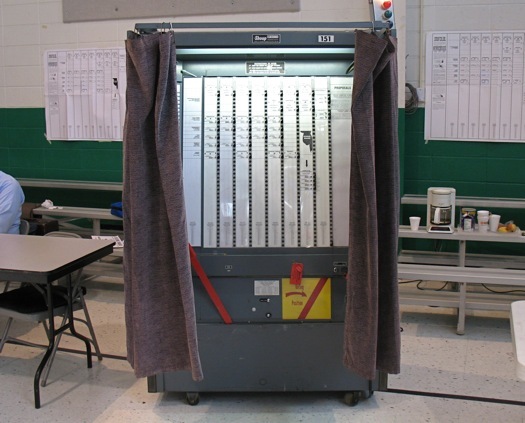 The Hudson County Board of Elections is expected to deliver an operating voting machine for tonight's Hoboken Chair showdown between Freeholder Anthony "Stick" Romano and current occupant Jamie Cryan. MSV referenced "hardware" coming into play in its Saturday story. Well, say hello to Jamie's little friend. Join at the donate link on the right. Unrelated: Big Monday news as Dana Wefer throws her hat in the ring for fourth ward council! Well there's your big Monday news. Never a dull moment in Hoboken.